In the garden of letters he will sow and plant, but only for the sake of recreation and amusement; he will write them down as memorials to be treasured against the forgetfulness of old age, by himself, or by any other old man who is treading the same path. He will rejoice in beholding their tender growth; and while others are refreshing their souls with banqueting and the like, this will be the pastime in which his days are spent. With the strokes of a pencil, a reader, a descendant of King James I and King James VI, marked sentences and passages that she treasured. For those with a bibliographical point of view, Walter Bagehot's Literary Studies went through four editions before the Silver Library Edition was first published in 1895, and reprinted five times after that. Nora Diana Maude's set is a married set of reprints. 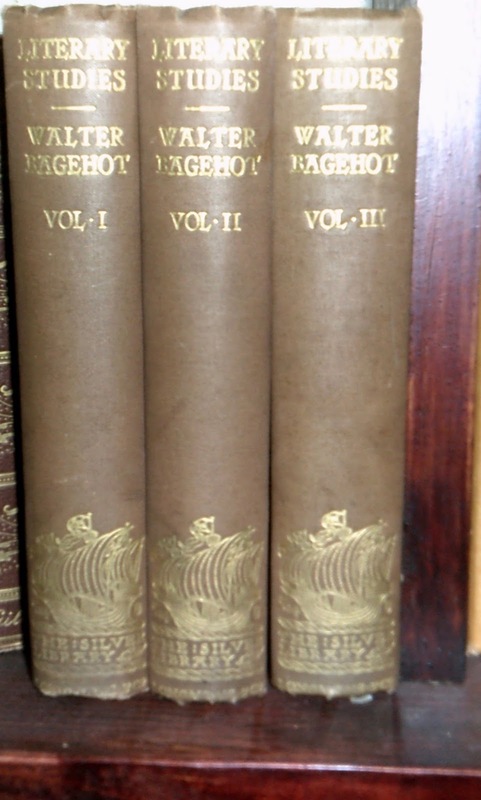 Volumes 1 and 2 were published in 1910 and volume 3 in 1907. I was stationed at RAF Mildenhall when I bought these books in a local secondhand bookstore, probably in the fall of 1986. Thinking back, I was thirty-nine years old when I bought these books. 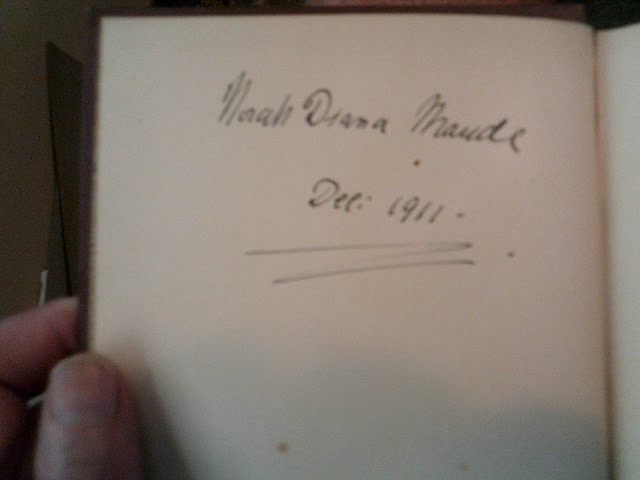 And Norah Diana Maude was all of twenty-two years young when she acquired these books. Most likely, the set of books was a Christmas present from either her parents, Frederick William Maude and Ellen Maud Kelk, or from her fiance, Arthur Marcus Hanbury, whom she would marry the following July. I gathered a little knowledge about Norah Diana Maude and her family while researching on the web. She had an older brother, John William Ashley Maude, a Lieutenant in the King's Royal Rifle Corps in WWI, who was killed in action in 1915. Norah and her husband had four children, including a set of twins. 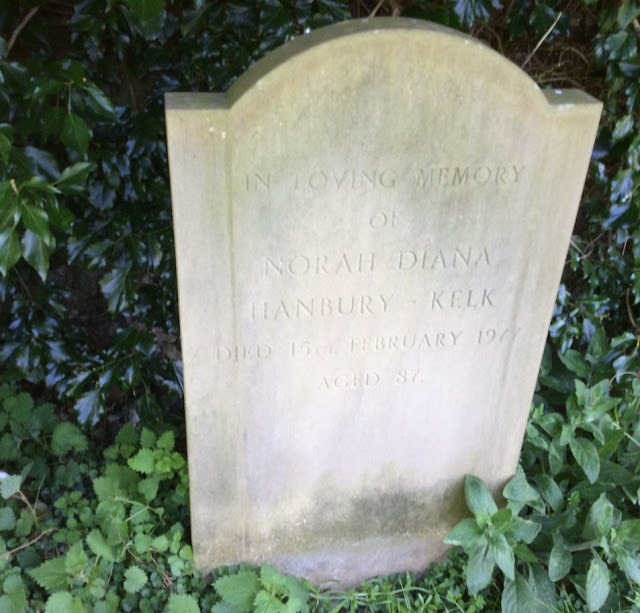 In 1934, she legally changed her name to Norah Diana Hanbury-Kelk (Kelk was her mother's maiden name). Hanbury Kelk Risby (Norah), neighbour of Sir Alexander Fleming. Memories of A. Fleming, n.d. Partly copies. 56216, ff. 33-38; 56220, ff. 11-17. I don't know when Norah read Bagehot's Literary Studies. It may have been in her youthful days, or it may have been when old age began to turn her hair grey. But however old or young she was, she told me a little bit about her inner self in the literary passages she marked in her books. In his essay, 'The Definition and Practice of Literary Studies," Wesley Trimpi defines literary studies as the understanding and preservation of literary texts. With the strokes of a pencil Norah identified the passages of Bagehot's text that she preserved as her own. Thus far I have only displayed Norah's markings from Bagehot's chapter on Shakespeare—and one parting remark from Bagehot's chapter on Shelley. Norah, it appears, liked the French poet and songwriter Béranger (1826-1877) extremely well. She marked at least fifteen eloquent sentences and passages in Bagehot's chapter on him. 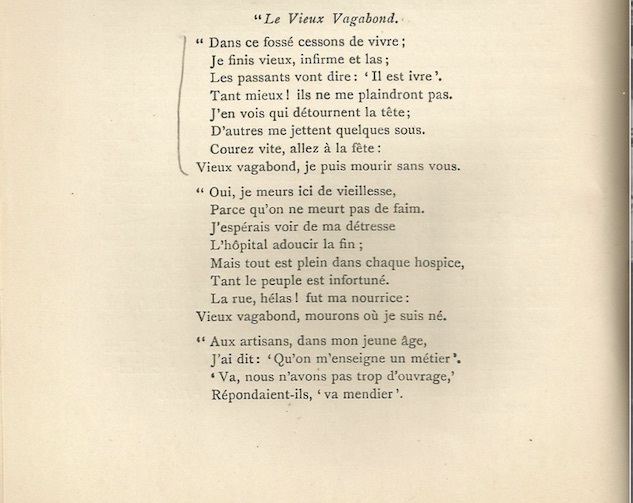 And I suspect she was fluent in French because she marked the first stanza of Béranger's poem, Le Vieux Vagabond as well. Perhaps a pleasant society is only possible to persons at ease as to what is beyond society. Those only can lie on the grass who fear no volcano underneath, and can bear to look at the blue vault above. She had exactly that sort of irritable intellect which sets an undue value on new theories of society and morality and is pleased when others do so too. I don't believe Norah ever read the third volume. All told, she marked at least 75 sentences and passages in the first two volumes. Norah Diana Maude—I will always remember her by that name— passed away on February 15th, 1977. But her great granddaughter, Layla Rose Hanbury, the Australian hip hop singer/songwriter known as Layla, has inherited her love of songs. After Norah died, her family gave eight hectares (almost twenty acres) of beautiful wetland in her name to the Suffolk Wildlife Trust. Living Landscapes, Living Gardens, Living Seas. The Norah Hanbury-Kelk Meadows are about three miles away from where I used to work at RAF Mildenhall, albeit more than twenty-five years ago. But if I could go back in time, I would visit the meadows often—and with Norah Diana Maude's books in hand to reflect upon.